Girona has become one of the top destinations in the cycling world since Lance Armstrong came and lived here and put Girona on the cycling map. He was wrong in so many ways, but also many people should be grateful for what he did. Girona has everything to be a paradise for cycling, no wonder many professional cyclists and triathletes live here nowadays. Good weather all year long, smooth roads, scarce traffic and polite drivers and last but not least, different terrain to train: flat roads, demanding climbs in the Pyrenees, and also nice hills not very long nor very steep, but ideal for a good training session. 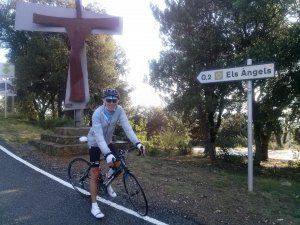 Els Angels: From Quart (close to Girona) to Madremanya. This climb starts just from Quart, very close to Girona, and is probably the most famous ot them all, as Lance Armstrong used to train and test himself in this climb when he lived in Girona. Girona side is 13 km long, and the other side from Madremanya is steeper and the road is not in so good shape. Anyway, fantastic climb to enjoy just beside Girona. Romanyà de la Selva: Road from Calonge to Llagostera. Romanyà is a lovely small village with a XIII century church and a couple restaurants, that’s all. There are 3 possible ascents: from Llagostera, from Santa Cristina d’Aro and from Calonge, which is the steepest. La Ganga: This is the road from Calonge to La Bisbal d’Empordà. Mild climb, lovely, twisty, easy, good asphalt, it has it all to enjoy cycling. Sant Grau: This is the road from Llagostera to the coastal road from Tossa to Sant Feliu de Guixols. No traffic at all, fantastic road specially on the sea side, which has steep parts close to 15%. The views to the sea are breathtaking. Worth a stop on you way down to enjoy the views. Magic. Previous postTranspyrenees trip next July!